Hi there! Today I”m sharing a review for a new release from Ann Gallagher (AKA LA Witt). I have really liked some of Ms. Gallagher/Witt’s recent books, like On the Clock and WHAT HE LEFT BEHIND, and was eager to check LEAD ME NOT out. Isaac Morris has devoted his life to preaching against the sin of homosexuality. But when his sister proposes a documentary to demonstrate once and for all that it’s a choice—with Isaac choosing to be gay as proof—he balks. Until he learns his nephew is headed down that perverted path. Isaac will do anything to convince the teenager he can choose to be straight . . . including his sister’s film. When Isaac’s first foray into the gay lifestyle ends with a homophobic beating, he’s saved and cared for by Colton Roberts, a gentle, compassionate bartender with a cross around his neck. Colton challenges every one of Isaac’s deeply held beliefs about gay men. He was kicked out by homophobic parents, saved from the streets by a kind pastor, and is now a devout Christian. Colton’s sexuality has cost him dearly, but it also brought him to God. As the two grow closer, everything Isaac knows about homosexuality, his faith, and himself is called into question. And if he’s been wrong all along, what does that mean for his ministry, his soul, his struggling nephew—and the man he never meant to love? This is a book about coming to terms with sexuality and features a Christian youth minister attempting to “choose” to be gay, in order to PROVE that homosexuality is a choice to turn from. Intellectually, it was a fascinating premise, and the execution of the story was exceptional. Isaac is the youngest child of a fundamentalist Christian minister whose teachings are undeniably homophobic. His twin, Ruth, convinces Issac–and their conservative family–that Issac should try to be gay and then return to heterosexuality, in order to prove that there exists a “choice.” Isaac is unsure of the wisdom of this path–he’s suffered impure thoughts of men his whole life, and his faith is also shaken by his recent divorce from his high school sweetheart. However, his brother John’s eldest son, Griffin, is showing definite inclinations down this sin-laden path and Isaac wants desperately to can help guide Griffin back to the straight and holy. Still, this premise is dubiously accepted by ttheir father and his congregation. Ruth and Isaac move to Seattle, to immerse Isaac in the “gay scene” which Ruth documents with video. Unfortunately, it’s not exactly what Isaac’s father’s preachings have professed. First, Isaac doesn’t witness the outright debauchery he expected. Second, while trying to find a suitable partner in the bar scene, Isaac is beat up by homophobic bigots, and the man who saves him is Colton, a shy and compassionate gay man. Colton is a former homeless child prostitute who’s had the roughest of lives since he came out in his early teens and his parents kicked him out. He’s suffered alcohol and drug addiction, exposure and depression, and come out the other side. He’s still tormented by the loss of his family, and works hard at Capital OUT (a gay bar) and the South Street Community Church, a gay-friendly church and homeless shelter for LGBT youth, sheparded by Pastor Mike, Colton’s surrogate father. Isaac is blown away that a gay person is a church-goer, and he’s sure that the heresy taught there is as big an abomination as homosexuality itself, but time and contact with Colton begin to soften Isaac’s feelings. Isaac takes Colton up on a job at Capital OUT–all in the guise of research–and is astounded by the normality and loving nature of the gay scene. As well as by Colton’s tenderness. (Expect some cameos from characters in other LA Witt/Gallagher books!) In the process of this experiment Isaac does some serious soul-searching, aided by Ruth, his ex-wife, and an estranged sister. I was really touched by the depths to which Isaac dug to understand his sexuality, and also to recognize that his opinions were slowly morphing as he gained new and valuable perspective. Meanwhile, Colton and Isaac are falling for each other. This is a cautious and quiet exploration. Isaac is essentially a shy virgin, and Colton suffers PTSD from the rapes and horrors he suffered as a rentboy. The emotional context of this story was so ripe and engaging. Do not expect a lot of steam, this book is all about the heart and the feels. Naturally, Isaac’s mission comes to light, and in the worst way possible. The resolution was outstanding, however, and the epilogue literally brought tears to my eyes. Really, I adored this book. The religious bits were so well done, and Isaac and Colton were not mere shells–they were whole, rendered persons that I cheered for throughout. Interested? 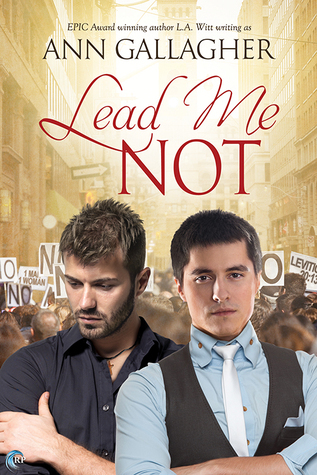 You can find LEAD ME NOT on Goodreads, Riptide Books, Amazon, Barnes & Noble and AllRomance. I received a review copy of this book via NetGalley. L.A. Witt is an abnormal M/M romance writer who has finally been released from the purgatorial corn maze of Omaha, Nebraska, and now spends her time on the southwestern coast of Spain. In between wondering how she didn’t lose her mind in Omaha, she explores the country with her husband, several clairvoyant hamsters, and an ever-growing herd of rabid plot bunnies. Visit Ann/Lori/LA on her website, Facebook and twitter. Thanks for popping in and keep reading my friends!